I realize I haven't posted in a couple months, so I thought that a short status post might be valuable. The brief summary is that you are likely to see continued sporadic posts here in the future, though probably less often than before (not that they were ever frequent!) I'm less likely to do updates every month/quarter of certain series of posts I've been covering, though I will make an effort to update them when the data changes in a noteworthy way. For example, the deflationary CPI trend is now becoming apparent to more and more observers and bears revisiting. Remember, Japan's deflation took years to arrive after its asset bubbles peaked. Other past topics likely to be revisited include Modern Monetary Theory, flow of funds data and borrowing trends, macroeconomic and market outlook, stock dividend trends, deflation outside the US, etc. New topics won't be frequent but I do have some some in mind. I didn't exactly plan to have an economics blog (I'm an engineer, for one thing). I initially set it up as an easy platform to share my macroeconomic and market outlook, distilled from much reading in the econoblogosphere, with a select set of real life acquaintances. However, I subsequently found myself becoming dissatisfied with some gaps in my knowledge and with some of the third party commentary I'd been reading, so I decided to do more digging in raw data myself, wherever possible, rather than only relying on the commentary and analysis of others. And at times the data has seemed worth sharing. I hope some have found it useful — this site has 60+ RSS subscribers via Google Reader (and I don't know how many in other readers) — a small number, especially given that many probably don't read all their feeds, but not zero! Other than general time constraints, the other reason for the shortage of posts lately is I've been putting a little time into attempting a second macroeconomic visualization that I hope could have broader value, if successful, than the last one (which I know still needs further updates). So if I make progress on it, look for a future post introducing it. It's the first actual "picture" of the so-called reverse-square-root-sign recovery that I recall seeing, and nicely shows two things. First, that the "Lehman Shock" probably did contribute to a collapse in confidence and GDP beyond that attributable to the Minsky-style private debt dynamics alone (though contagion and adverse feedback loops were certainly a real risk that could have kept GDP on its downward path, even so). Japan's GDP never fell this dramatically, even after its own giant asset bubbles popped. Second, it shows the uncertain future with respect to the degree of ongoing private sector deleveraging versus government fiscal stimulus. GDP hasn't been on a downward path, but GDP growth certainly has - since Reagan. I think Koo's chart might be optimistic. Stimulus is over, housing and unemployment crises appear not to be. Recent productivity gains have been at unsustainable levels. Wealth is being transferred (again since Reagan) from the have-nots to the haves, who use it to wreck the economy by gambling with highly leveraged assets. Where is future GDP growth gong to come from? I'm interested in seeing what you have to say. Economics is too important to leave to the economists. Gotta run. Busy night ahead. Keep up the blogging! I love your thought offerings. Well, GDP was on a downward path for about a year, though you're right that GDP growth had slowed well before that too. My interpretation of Koo's chart was that he leaves it pretty open ended with the question mark... i.e., GDP could stagnate, decline, or grow, depending in part on how the two factors he highlights play out. I didn't see it as too optimistic. But yes, there are ugly downside scenarios that still could play out. As you say, current stimulus has peaked, and housing and employment are not looking good. Further GDP growth will not come easily in the face of continued private sector deleveraging, but I think it could still grow some of the time over the next couple years, if slower than we'd like... via government deficits, potential reduction in the rate of private deleveraging, increased exports, expansion of labor force, etc. 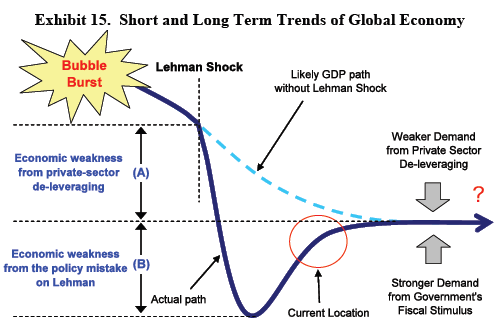 That's assuming no major new global shocks, but of course several potential ones loom. Let me add my voice to the chorus of appreciation-- I dig your thought offerings and hope you'll continue to blog when time permits. Thanks for that chart. I hadn't seen it before. As far as the question mark goes, Koo is now saying that it we are still in a balance-sheet recession and cutting back on stimulus too soon will lead to stagnation or cause a double-dip, the depth of which will be determined by the degree of austerity imposed, should deficit hawks prevail. Then there is the Eurozone, on one hand, and a possible Chinese RE bubble on the other (Andy Xie). This would be a big shoe if either drops. Agreed! And with respect to potential further shoes to drop, I'd add deflating housing bubbles in other countries too, and even deflation itself assuming it becomes more persistent, whether or not acute (more of a slow motion shoe drop!) Of course conventional economists seem to take the rational expectations stuff way too far, but I wonder if even a mild shift from the current majority fear of inflation to a deflation mindset might be the catalyst that finally drives up the private sector [attempted] savings rate. jmperry- Thanks, I hadn't intended to solicit comments, but I am glad to know you and others have found this worthwhile, given I'm a bit unqualified in some respects to be doing this in the first place...!